We’ve had some warm days lately in northern Southeast Alaska, and if perception is worth anything, it always feels warmer just coming off winter. Actually much of Alaska feels this surge of warmth in May (and sometimes in April), but it is a time of the year when southeast can keep up with the interior and southcentral areas in terms of summer-like warmth. (And compare our sunny, 70F (21C) to Colorado, Wyoming, etc., where they just got more than a little snow.) 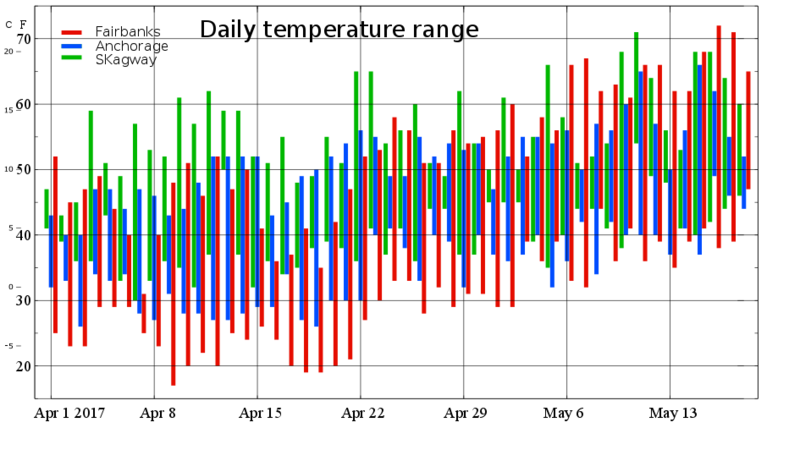 Here’s the daily high-low graph for Skagway, Anchorage, and Fairbanks since April 1. You can see that Skagway (as well as other parts of the panhandle, particularly the northern parts) is an early bloomer with regard to spring temperature spikes compared to the other regions. However, this is starting to change the interior keeps getting steadily warmer, and coastal warming stalls out some as onshore flow increases. Onshore vs offshore flow is a crucial driver of the weather/climate in coastal areas. In general, high pressure predominates over the continent in winter producing offshore flow which brings dry, cold, windy weather to the coast (yes, there are commonly interruptions that bring mild, wet weather, especially in early winter). In summer, pressure is usually lower over the continent and onshore flow results, keeping coastal areas cool, with ample clouds, fog etc. Right now we’re in the crossover season…the offshore flow has been still with us at times, but the cold interior air that hits like a ton of bricks in January is gone. The interior has thawed out, and as that moderately warm air descends to the coast, it warms further due to compression, and places like Skagway, Haines, Juneau, Valdez, and Seward might be surprised to find themselves listed as the warmest spots in the state, and sometimes get to gloat over big regions in the lower 48 that are hanging onto winter. Skagway has bagged quite a few daily Alaska hot spot medals this spring. 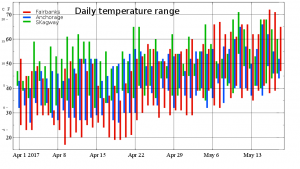 The following meteogram shows an example day from Skagway. When the north winds picked up early in the morning the temperature jumped too. With the addition of the sun during the day it make it to 65F (18C), cooling off some as a light southerly (a weak sea breeze) developed. In spring and summer the large-scale onshore flow manifests itself as a stiff sea breeze in many places due to the local sharpening of temperature differences. More on the sea breeze phenomenon here and here. I’ve highlighted non-interior stations in green. My data only run through 2010, so if any readers know of any updated records to this list, please share them. The records at Tenakee Springs and Snowshoe Lake seemed a bit implausible to me, so I looked at the scans of the original paper forms…nothing obviously fishy…they are official records. 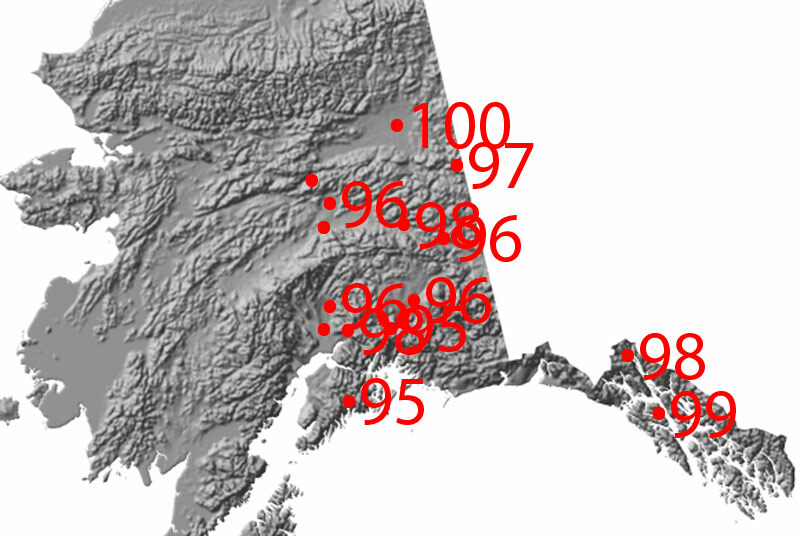 Would you have guessed that coastal or near coastal towns are 3 of the hottest 5 in Alaska? Grab an ice-cold lemonade and let me know your thoughts on the topic via the comments link below.